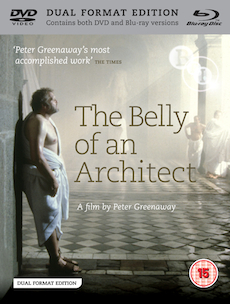 Brian Dennehy stars as an American architect slowly losing his grip on life while working in Italy on an exhibition for the eighteenth-century French architect Etienne-Louis Boullee. One of the most visually striking films of the 1980s, with a celebrated score by Glenn Branca and Wim Mertens, The Belly of an Architect shows one of British cinema's true visionaries at the height of his powers. Insight: Terence Conran (Peter Greenaway, 1981, 15 mins): portrait of the designer and entrepreneur with an uncredited score by Michael Nyman. Extensive booklet with essay, interview, biographies and credits by Michael Brooke, Donald Ranvaud and Marcia Landy. DVD-ROM content featuring original script, press pack and sheet music.